Why is this place called Chaoszone? Because it would sound nerdy and cool. But also partly because I like the idea of non-linearity in science. Partly because I like the beauty that chaos often hides -- fractals being the most common example. Which should explain colorful images you see on fractal art sites around the web. Do the words non-linearity or fractals not ring any bells in your mind? Here's a simply written introduction to Fractals and Chaos theory in general, and this page tells you a bit more about the behind-the-scened mathematics. Or, if you're in the mood to read a book, I highly recommend Chaos: The Making of a New Science by James Gleick. Part of Chaos' charm has always been that it does not require large computers, expensive atom blasters and electron microscopes to understand -- unlike so much of 'big science' nowadays, especially particle physics -- all you need is a inquisitive mind and a quick eye. When you see clouds coalesce and drift away again against a blue sky, have you ever wondered why they join in that particular way and no other? Have you mixed milk into a swirling cup of coffee or watched a cloud of cigarette smoke drift as it swirled upwards? 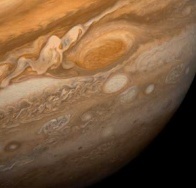 Or wondered what makes the Great Red Spot a permanent feature on Jupiter or how a tiny seed encodes all the branching information needed to create a giant oak tree? In these, and in many other things, chaos lurks. Chaos theory is an odd -- and fascinating -- mix of physics and mathematics, with generous doses of ecology, biology, economics and meteorology thrown in for good measure. It attempts to explain the world in a way very different from the world envisioned by Newton, governed by three simple laws. It admits -- asserts -- that the ways of the world, be it weather or cotton prices or the Dow Jones , cannot be predicted. Instead of predicting one absolute future state of any system, chaos theorists iteratively explore the many possible states it can achieve. Of course, all of this calls for some heavy-duty number crunching. Which brings us to computers, since it's not fun trying to compute the (relatively simple) transformations for the Mandelbrot set (on top of the page) by hand on graph paper. Many programs are available for generating fractals like the ones you see scattered throughout Chaoszone. One of the best is Fractint, available for MS-DOS, MS-Windows and X/Windows. Download it and give it a try. Even if math was never your forté, you will like the pictures generated -- fractals have plenty of gee-whiz value. Fractint is a bit dated however, especially with its inability to generate true-color fractals, as well as a rather archaic interface (the Windows port, Winfract, alleviates the problem somewhat). You might like to try the tiny, free Aros Fractals if you just want to get your feet wet with fractals, or try the extremely powerful Ultra Fractal (shareware, 30 day evaluation) if creating gorgeous eye-candy is your cup of tea. An excellent resource about creating fractal-based graphics is The Infinite Fractal Loop, a webring devoted to this art. But why do the site graphics show up as ChaosZone!, complete with a completely gratuitous exclamation mark?